Health and Beauty Girl : Week 3: My Health and Weight Loss Journery to Get Fit and Lose Weight! Week 3: My Health and Weight Loss Journery to Get Fit and Lose Weight! Today is the end of week 3 of my health and weight loss journey. I totally fell of the "workout wagon" this week. I'm not going to make any excuses, I'm just going to climb back on. (Here is week 2 if you missed it). 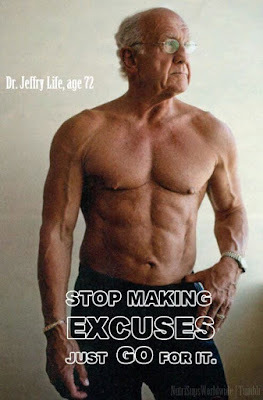 I came across the picture above of Dr. Jeffry Life while I was online this week. He is my inspiration this week to keep going. Dr. Life goes to they gym 5 days a week. He has written 3 books on health and diet. It also states on his website that he's been on a number of TV shows. I had never heard of him until I saw this photo online but he's definitely captured my interest and I would like to learn more about what he has to say. I think it's pretty amazing to keep a physique like that in his 70's. I just want 1/2 of that and I'm a few decades younger, so I know I can do it! If this man isn't inspiring, I don't know what is. I'll be back next Friday with an update on the week to come. Hopefully I'll do much better this week!